Get equipped with the Sun Joe Pressure Joe SPX1000— your smart solution for home, outdoor and auto cleaning projects. The Pressure Joe SPX1000 is ideal for tackling a variety of light-to-medium duty cleaning jobs. Use it to clean boats, motorcycles, RV’s, ATV’s, trailers, decks, barbecues, siding and more. Packed with a powerful 1400-watt motor, Pressure Joe delivers up to 1450 PSI of cleaning power and a maximum flow rate of 1.45 GPM, which means you’ll get your cleaning chore done faster and easier with less strain and fatigue. Extend your cleaning reach with its 33-inch wand, which features an adjustable spray nozzle to easily change the water pressure from an intense, zero-degree jet spray to a gentle, 45-degree fan spray. Plus, the Pressure Joe SPX1000 is lightweight and compact so you can easily tote or wheel it from one cleaning task to the next. Good for stains but with otherwise little power for effective cleaning, this electric pressure washer from Sun Joe will be a disappointment if you’re counting on one basic function: washing with cleaning agent. There’s no soap capability, even as an extra-cost option. There’s a quick connect, but only at the wand end. The unit is wheeled, but you’ll need to either bend unnaturally over or carry the 15-pound washer by its handle. You get one adjustable nozzle tip. And the trigger safety must be manually set. Moving around can be cumbersome. Easy to operate — just plug it in — but may need an adapter for some outlets. Easy hose storage. Cord is very easy to wrap and store. Wand not as convenient to remove. Very easy to use and read on-off switch. 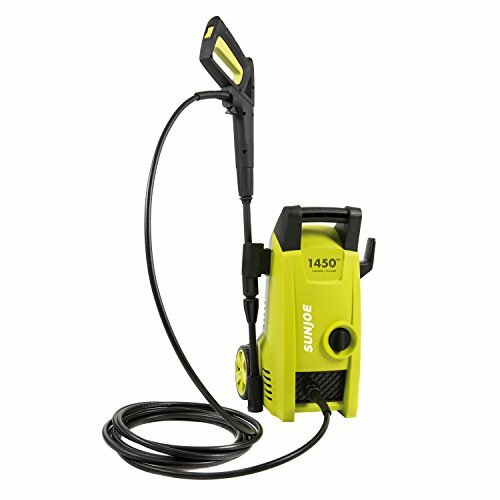 The Sun Joe SPX1000 is part of the Pressure washer test program . In our lab tests, Pressure washer models like the SPX1000 are rated on multiple criteria, such as those listed below.